Since I mentioned the accident at La Fiesta on Alhambra Blvd. a few weeks ago, I’ve been eagerly awaiting the store’s reopening. And judging by the looks inside it will be a while. Next to the sign are two large photos of the accident in case you didn’t believe them. i’ve been to this place 3x in the past 2 months. excellent – $8 shrimp taco that must weight 2.5 lbs. very nice staff. they always help me when i have the kiddo with me … i don’t understand the mediocre reviews. the food seems pretty decent for a neighborhood tacqueria to me. I agree with you, Moe. I’m itching to get back in there. I’ll stay on it. What the hell is wrong with these people? 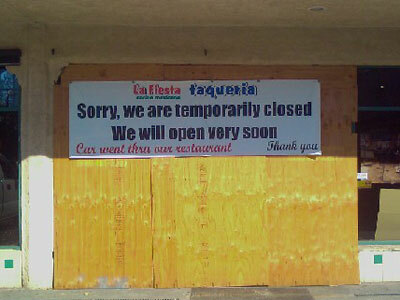 They should be open by now unless there is an insurance problem…. like the owner doesn’t have any insurance. My favorite thing to get here is the breakfast burrito. It is HUGE, I will often eat half for breakfast and save the other half for lunch. Come back, La Fiesta, come back!!! In our search for burrito satisfaction, SinghCity and I ventured east down J street to Midtown/East Sac Taqueria for lunch today. While the name thing still seems to be an issue the food was great (pollo asado burro) and the environment was pleasant. Parking is always an issue on J street (Peet’s & Starbucks? Forget it), but we pulled right up and found a spot quickly. Ron, that place is pretty darn good, you’re right! I have been meaning to return to MidEastSacTown Taqueria since that early review as I’m sure some of the kinks have been worked out. Also since then I have refined my burrito taste to the point where I avoid the crema. On beautiful days like this, however, it’s very easy to enjoy your meal when you’re outside soaking it all in. If Ratatouille taught me anything, it’s that your state of mind is very important when you’re a foodie. For the first time ever I saw some work crews out there this morning fixing the glass so maybe an opening is forthcoming. Update: La Fiesta is O-P-E-N! FWIW., midtown taqueria is owned by the same guy who owned sidewalk pizza. He is in no way even close to being of any kind of Latino decent. It might not matter to any one else but considering how stereotypical the entire layout of midtown is, I find it quite offensive that a Lebanese man would try to fake his way to a successful Mexican restaurant because pizza wasn’t hip anymore. If the food is good, I don’t think that Nuremberg-style racial purity laws should be imposed on who makes it. I can’t vouch for the food, I haven’t eaten there—but I take mild offense that only mexicans should be able to sell tacos. Close down Korean-owned sushi joints, and Midtown suddenly has lots more empty buildings to convert into lofts. 95% of the Italian food in the US is not made by Italians, that’s for damn sure. That’s confusing. So which race is supposed to make my pancakes? Josh – I can recommend a house where you can sample the pancakes of various nations, which should help you narrow down the answer. Ha! That was after I got into a tussle with a pack of Fabios. It was fabulous!